Julian McKeon’s Fiesta theme relayed a relaxed get together with a southwestern buffet lunch. 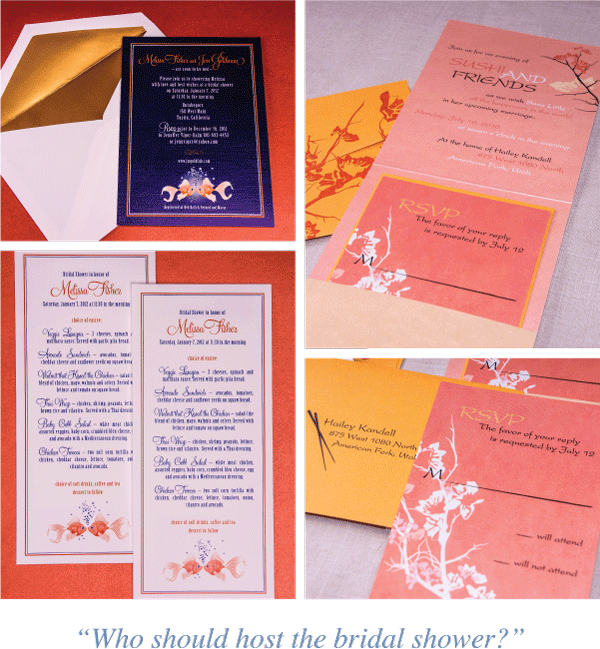 Kimberlee Sirstins’ invitation is a great example where multiple family members come together to host the bridal shower. 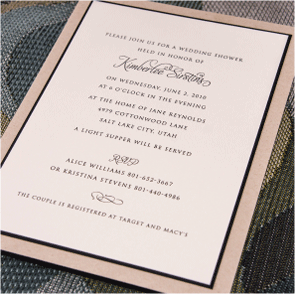 The details of layers and clean lines make for a beautiful classy invitation! [/one-half][one-half-first]Hailey Kandell’s invitation for Sarah Klothorr indicates a more formal dinner party with her details for cocktail attire. The invitation itself is gorgeous down to the last detail. With the layering on an elegant wrap and champagne ribbon, it really captures the mood for the occasion. Rachel Francis’ invites for Kate Feinstein is a fun and more modern invitation with an additional teaser of the upcoming Bachelorette party. Fun side note: Rachel has gone from bridesmaid to one of our current brides!